When the earthquake shook my house last week I was in my second floor office sitting at my desk. As the house swayed for several long seconds, my first thought was that it was me doing the swaying and not the ground and the house. So, from a certain perspective, finding out it was actually an earthquake was kind of a relief. Still, I was kind of shaken (no pun intended) by the experience, and a nice soothing cup of tea, served with something sweet (but quick and easy to make), seemed in order. I’d been wanting to make sweet palmiers after making some savory palmiers as an appetizer a few weeks ago. Since I developed a recipe for Shortcut Baklava in my soon-to-be-released new book, Quick-Fix Vegan, I though the idea of baklava palmiers might just work. And they sure did! The flavor of baklava in an easy and elegant cookie that required only 5 ingredients. 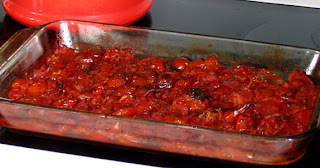 Recipe by Robin Robertson © 2011. In a bowl, combing the ground nuts, sugar, and as much cinnamon as you like in your baklava (from a pinch to 1/2 teaspoon). Mix to combine and set aside. Roll out the puff pastry on a lightly floured work surface (you can roll it out between sheets of parchment paper if you like) into a 10 x 14-inch rectangle, trimming the edges if needed so you have straight sides. Cut the pastry rectangle in half width-wise to create two long narrow rectangles (10 x 7-inches). Use your fingers to carefully roll one short end of a pastry rectangle towards the center and then roll the opposite end towards the center so that they meet in the center and look like two scrolls. Press gently to make sure the rolls stick together. Repeat with the second strip of pastry, then wrap the pastry rolls separately in plastic wrap and refrigerate until firm, 1 to 2 hours. Bake until the pastry is nicely browned, about 12 minutes. If they start to brown too much on the bottom after about 10 minutes, flip them for the last 2 minutes or longer, if needed. When the palmiers come out of the oven, you can drizzle them with more agave, if desired. 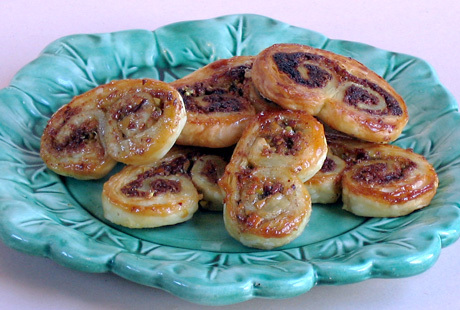 Transfer the palmiers to a plate and serve warm. THANK YOU!! Many thanks to all who “Liked” for my Walnut Crusted Artichokes on One Green Planet. Your votes have catapulted this recipe to the top 10 most popular vegan recipes on One Green Planet. 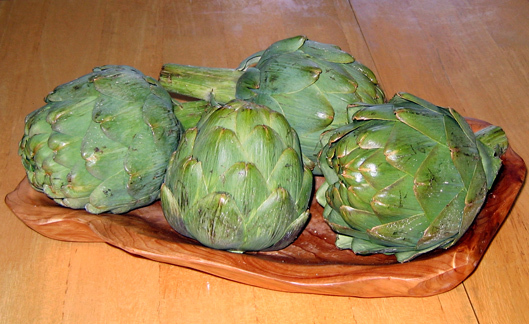 As such, the artichoke recipe is now posted on the Huffington Post — and you all made it happen. I really appreciate your support! You can see my recipe here on Huffington Post. BOGO SALE: Over at Vegan Heritage Press, there is a great sale going on. You can now buy two copies of Vegan Unplugged for the price of one, at an already great price of $11.95 plus s/h. That’s like paying only $6.50 per book! 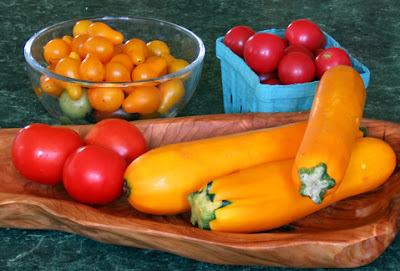 If you or anyone you know lost power during hurricane Irene, then you need Vegan Unplugged. And with this great sale, you can buy one for yourself and give the other copy to someone you care about. Okay, now that I have your attention, let me clarify…VOTE FOR ME for a chance to WIN A VEGAN CRUISE! If you participate in the survey, you'll have a chance to win some great prizes because you’ll be automatically entered in the Grand Prize Drawing to win fabulous prizes including a Vegan Caribbean Cruise, a year's supply of Coconut Bliss Ice Cream, a VitaMix and more! Click on this link and please vote for “Robin Robertson” (cookbook author) and “Global Vegan” (favorite column). And good luck — you may just be a winner yourself! It's been awhile since I posted a new recipe, but there's a great one coming soon, I promise! Besides, I've been so busy working on the manuscript for the new slow cooker book. We've been enjoying the various cherry tomatoes in salads and as a sweet snack, but I transformed many of the larger tomatoes into this fabulous baked sauce. We had it over some long fusilli and I'm sure you could hear our moans of ecstasy for miles. 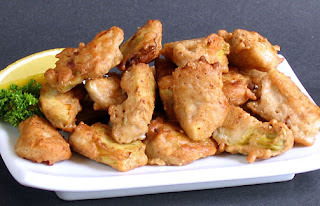 Help my recipe for Walnut-Crusted Artichokes make it to the Huffington Post. -- Just "Like" it via the Facebook Like button on this page on One Green Planet. The recipe getting the highest # of Likes will be displayed on The Huffington Post! And while you're at it, make some of these fabulous artichokes hearts (the recipe is on OneGreenPlanet). When I posted about my French dinner last week I got lots of nice comments and e-mails, not only about the meal I prepared, but also about plans for a vegan French cookbook. They also asked me to share my thoughts about my old restaurant days when I worked in French restaurants. The photo above was taken in 1986 (!) in front of Marianne, a then-popular French restaurant in downtown Charleston, S.C. That’s me in the front row (third from the left) — the only one wearing white pants. Assembled with me were many of the top chefs in Charleston at the time. The reason we were all together was to cook a multi-course benefit dinner for a charity fund-raiser — on our only day off. After working as a cook for several years in Pennsylvania, I move to Charleston in 1983 when I was hired as a chef for a Charleston restaurant. I worked as a chef at a few other restaurants in Charleston during those years, but the only strictly French restaurant was called Amalie. It was an intimate, elegant space down at the Battery looking out onto the Charleston harbor. Those professional years in restaurants gave me the background I needed for my current career, developing recipes from various cuisines for my vegan cookbooks. As for a French cookbook, the answer is yes. For many years, I've been planning to write a "French for Vegans" cookbook. Somehow, other projects always seem to get ahead of it, and so it has remained simmering on the back burner for a long time. With all the interest and enthusiasm I'm hearing from you all, I hope to move on to it after my current project is finished. In the meantime, my new book, Quick-Fix Vegan will be out very soon and is now available for pre-order on Amazon. Work (and recipe testing) is currently going on for the new slow cooker book. Thanks again to one and all for your interest and your kind comments, notes, and messages. Your appreciation for my work sustains me. 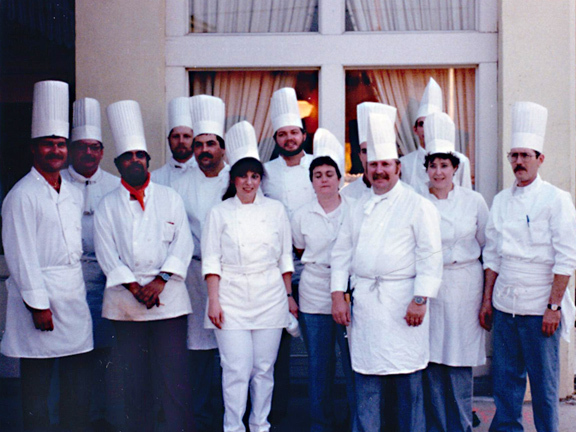 In the 1980s I was chef at a small French restaurant in Charleston SC. After that, when I worked for a catering company, many of the menus featured French cuisine. When I first went vegan in the late 1980s, I took special delight in “cracking the code” of the meat and dairy-laden French recipes into plant-based versions. I admit I don’t cook French food very often these days. Mostly because there are several other cuisines that beat it out as favorites in our house. We tend to gravitate to Thai, Italian, Indian, and Vietnamese dishes, interspersed with good old American. But French, not so much. Last weekend we had friends over for dinner. When company’s coming, I often like to plan a menu around a particular cuisine — usually one of our aforementioned favorites. This time, however, I decided on French. We began with Kir Imperial as an aperitif — one part framboise (black raspberry) liqueur to two parts chilled sparking white wine. 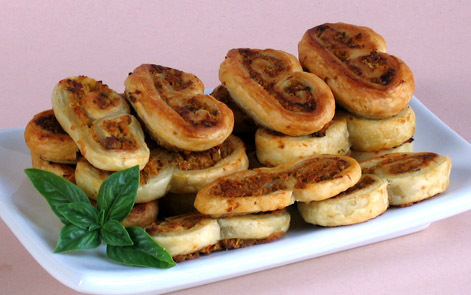 They went down nice and easy served with a plate of crispy-flaky and delicious palmiers filled with a tapenade made with green olives, capers, sun-dried tomatoes, artichokes, and roasted bell pepper. 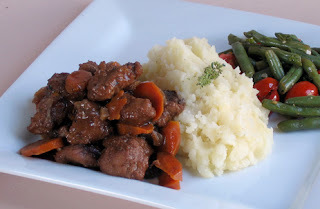 The main event was seitan bourguignon or “au vin” — chunks of seitan simmered with mushrooms, shallots, and carrot in a red wine sauce, seasoned with thyme and some herbs de Provence. It was served with mashed potatoes and green beans provencale. For dessert, I wanted to feature blackberry coulis made from our own blackberries, so I made a plain cheesecake to pair with it. 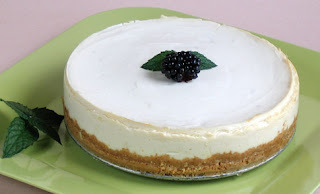 At the last minute, I added a couple tablespoons of lime marmalade to the cheesecake batter and — wow — that touch of citrus really added a fantastic flavor dimension. After such a fabulous meal, I can tell you that French for vegans was definitely not lost in translation! I may need to revisit my list of favorite cuisines…. 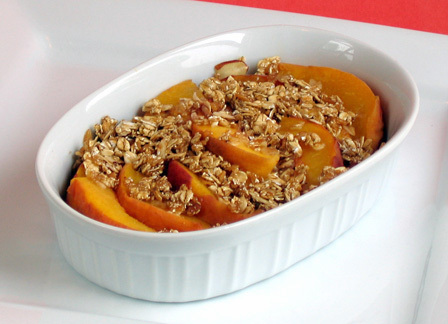 Too-Easy Peach Crisp: Two ingredients. Two Minutes. 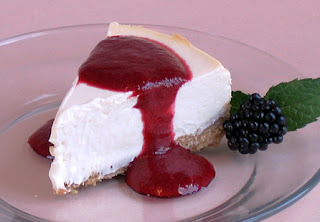 This dessert is so ridiculously easy to make, I don’t know if you can even call it a recipe. I made the lovely peach crisp that you see in the photo in two minutes (including prep time!) and using only two ingredients. Here’s how it came about. I wanted to use up a couple fresh and very ripe peaches. These particular peaches weren’t the best—not much flavor—so I wanted to jazz them up a bit to make them more palatable. What happened next was a revelation. I sprinkled a small amount of granola in the bottom of a dessert dish, cut a peach into slices, and spread the slices on top of the granola. I then sprinkled a little more granola on top, covered it with plastic wrap, and microwaved it for 1 minute. Wow. I wasn’t prepared for how delicious it was. I really can’t believe it, even now, and I’ve made it twice. It turns out that the short amount of microwaving is just enough to heat the peach, bring out the sweetness, and release just enough moisture to soften and warm the granola slightly. The peach now had a “just-picked” and warm-from-the-sun flavor, and the granola tasted extra good, with the flavors of the oats and almonds coming through brightly. This makes an amazing impromptu “fancy” dessert (depending on the dish you make it in) that tastes oh-so-homemade. Plus, it’s great for a single-serving treat, if you just want to make yourself something quick, easy, and sweet (but still on the healthy side). The Two-Ingredient Two-Minute Peach Crisp should be declared a new wonder of the world. It’s that good. I can only imagine how much better it would be with a scoop of vegan vanilla ice cream.